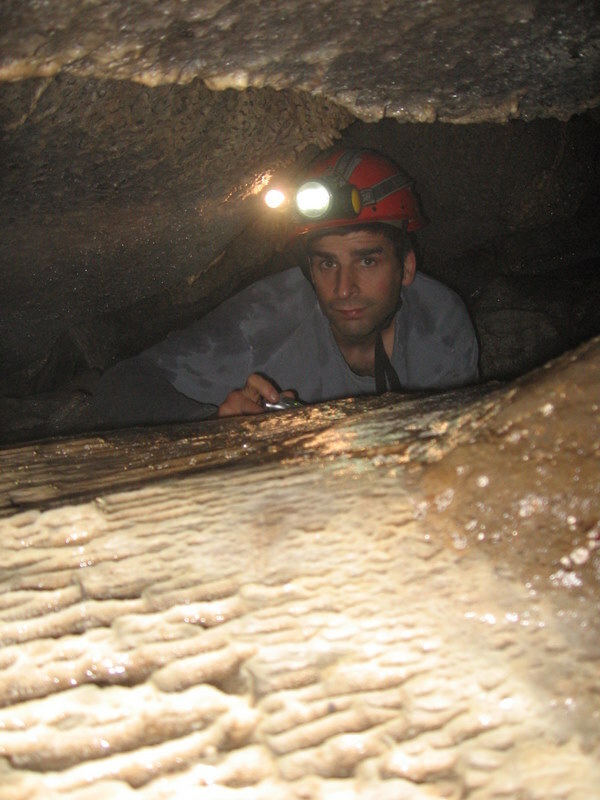 likely resurgence of Bed of Glass Cave – Ontario, originally uploaded by Mic2006. This is kind of a neat little karst area where we found a number of small caves in close proximity to each other. 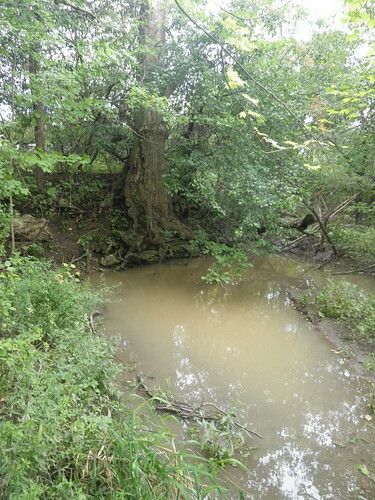 The picture above shows the resurgence beneath this dead tree of the sink several hundred feet away and also a couple of closer sinks. From what I can tell there is about a kilometer square catchment and everything funnels into the lowest point at the center of a farmers field. 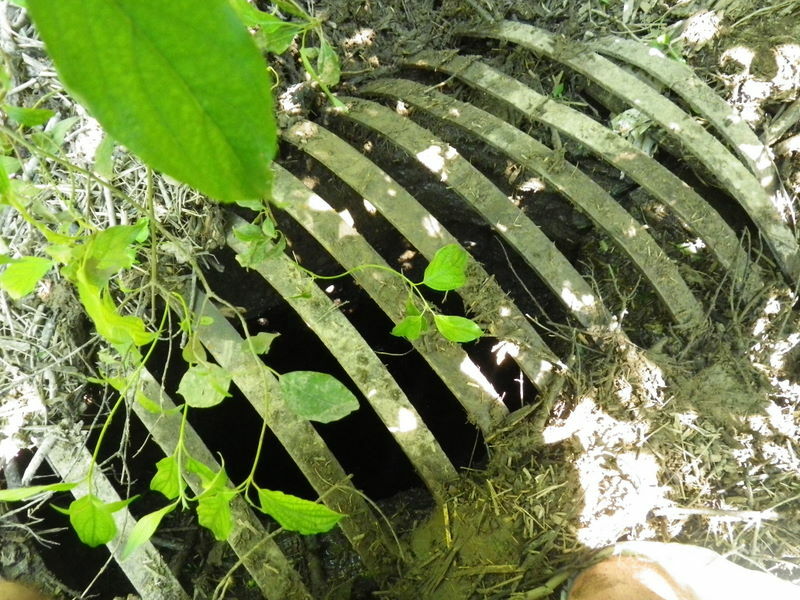 A valley that is choked with garbage, hawthorn, and vines hides several cave entrances. Only Bed of Glass cave seems to have much promise as there is a water filled passage at the end with some airspace that I’d intended to push. A raccoon at the end of the tunnel won the turf war and so I left the pushing of that tunnel till another day. Entering into Bed of glass you must burrow through a heap debris at its entrance. Looks like when it rains the sink and surrounding valleys fill up with water (about 15 feet deep) Everything in the fields ends up in the sink. JC and I went to Wasteland Waterway Cave today to do a bit of mapping. Well that was not entirely successful because although my waterproof paper held out, the supposedly waterproof marker did not. we only got about 7 shots done and were a little over 100 feet in before we had to quit. As soon as I got home my mother called to see if I’d been caving and if so had it rained where I was. No it had not, the weather report for that area had no indication of bad weather and although the sky looked grey all was well at Wasteland Waterway (thankfully, obviously Goderich was a different matter. My brother-in-law had his porch torn off by a tornado). Nevertheless, as a backup precaution in case of rain we had dug open Blue barrel sink as our flood escape route. See the short video for cave mapping equipment here – cave mapping equipment. 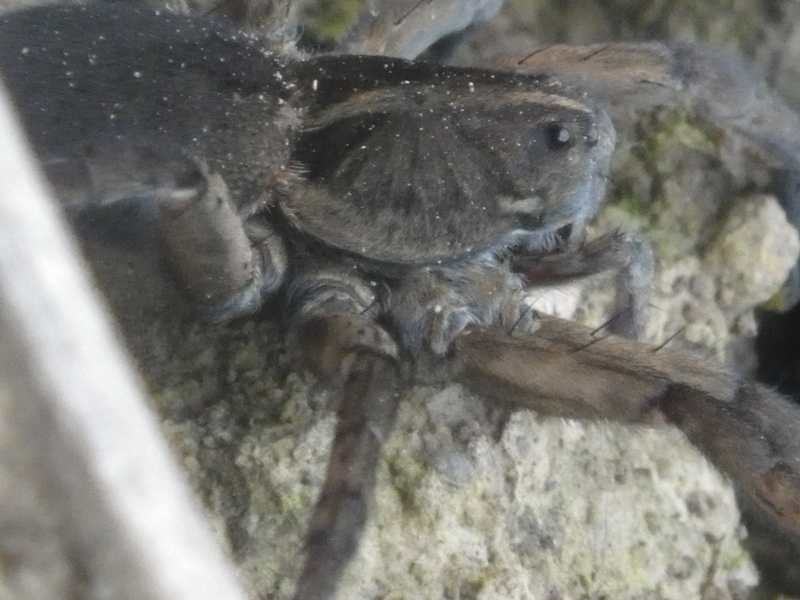 The spider pictured above was one of several that was lurking around blue barrel sink. I believe this is what they call a hunting spider -it’s about 2 inches across, not as big as the ones in the Moira cave, but still big enough for me. In fact these looked a little different from those at Moira; notice the spiny hairs on it’s legs. I always thought spiders had 8 eyes, this one appears to only have 2 on either side. So anyway it was pretty creepy sliding down the sinkhole knowing that there’d be more such creatures, some possibly even larger lurking in the crevices. We also discovered another cave when we dug a sinkhole open – more on that tomorrow. 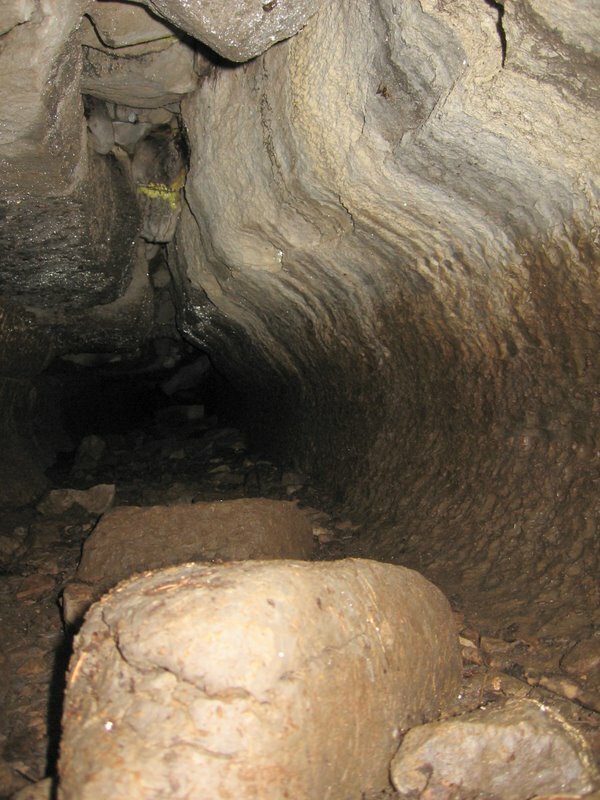 New Ontario Cave – Travertine cave, originally uploaded by Mic2006. We were fortunate again. This weekend we investigated a picture that we’d seen on the internet. This in place of our anticipated trip to Wasteland Waterway to begin mapping. We had anticipated rain today. You do not want to be in Wasteland Waterway when it rains – you will drown. As we had seen on the internet, there was this waterfall with a promising looking slot at it’s base that apparently led off underground. We never even checked the slot that we’d come to see as there was this much more obvious hollow. Looking up the passage in this hollow we realized that the formations were too delicate to allow us passage, but still it was a beautiful thing to see. This cave seems to have formed in the cavity between an undercut cliff edge beside a stream and the tufa (yes I know we called it Travertine Cave) that poured down like a curtain to enclose it. See a short video of the entrance to the cave here … Travertine Cave – a newly discovered Ontario Cave. Greg, Jeff and I have been considering the possibilities of a cave dig here. A tunnel leads off and with some small amount of persuasion we can probably break the boulder at its entrance and then we’re into cave. We’re just in the process of consulting with the landowner. We popped this grill off from above the hole and in the accompanying video you can see something of what was beneath. More on this sink in my upcoming book on Caving in Ontario. You will be able to order it from the Edgehill press website in about 2 or 3 months. Spanky’s Paradise is certainly one of the more exciting cave discoveries that I’ve been involved with. Of particular note are the formations and also the knowledge of other tunnels in the area. Spanky’s is under an escarpment and there are several buried joints that follow into this ridge, all along the same orientation as Spanky’s. This past weekend JC and I identified one such joint as likely to open into tunnel with a little rearrangement of the rock around it. We pretty well know that this escarpment is absolutely hollow. 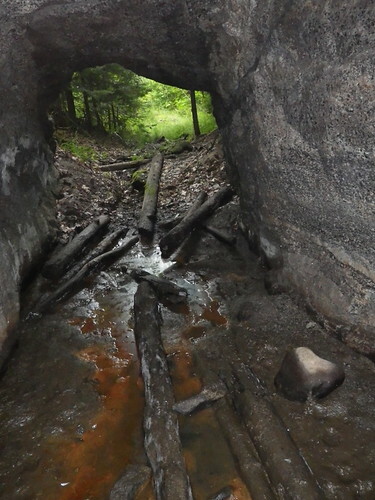 I can only imagine the incredible sight of buried Ontario cave tunnel exposed to my headlamp for the first time. Check out these videos of Spanky’s Paradise. 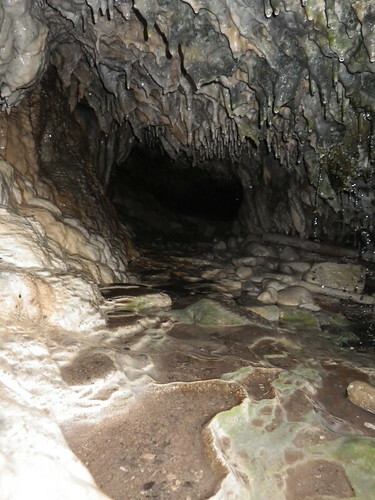 Sadly my humble efforts hardly portray the incredible beauty of the cave. Here are 2 links to video that I took this weekend. Both these short clips are of Pilgrim’s Crawl, an Ontario cave that is yet to be followed to it’s end. I’d say the biggest problem are the tunnel’s scallops, it’s like crawling against a cheese grater and my cave suit shows it after doing so. At this time I’m still getting the hang of this video thing, I like it and see it’s potential for documenting our explorations in the newly discovered “Wasteland Waterway Cave”. One point is that I need to increase the lighting – especially as Wasteland Waterway has much larger tunnels. Some are well above your head. More on that in the following weeks and hopefully I’ll have my new caving book in about 2 – 3 months. It’s taking a while because I’m trying to get it right.